THE B-HIVE: 5 Bedrooms, 3 Full Bathrooms, Accommodates up to ten (10) guests. The 'B-Hive' is available for rent to mature, quiet, respectful and responsible families only. If you are looking for a place to have loud, wild parties all night long, please continue your search as this is not the property for you. Our home is rented on a WEEKLY ONLY basis between Memorial Day and Labor Day. Shorter stays are allowed September through May with a two (2) night minimum. 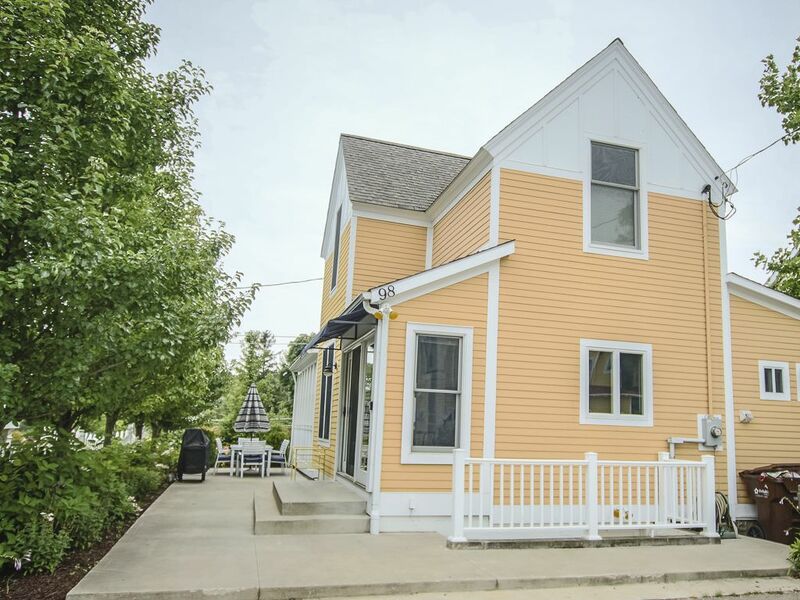 This beach house is perfectly located just steps away from South Haven's beautiful North Beach. The key to this location is that there are no huge hills nor endless staircases to climb up and down when walking to and from the beach. This is an important detail many property owners forget to share when describing the location of their property!!! The B-Hive has five (5) bedrooms with three (3) full baths. The bedrooms consist of four queen beds and the fifth bedroom has one combination twin trundle bed. All of the rooms are tastefully decorated providing a comfortable feel throughout. Please click on our up to date calendar to see if your desired dates are currently available. New fixtures, finishes and furnishings!!! : The house has been remodeled with new finishes and appliances while maintaining the feel of it's original character and architectural details. The outdoor patio is approximately 400 square feet and is perfect for a barbecue after a relaxing day at the beach. Within walking distance are several excellent restaurants, parks, shops, and the new municipal marina. With something for everyone, the B-Hive is without question the best location for your family's summer vacation! Please click on our availability calendar to see if your dates are available. Three full baths!!! : We often hear from our guests that previously rented homes that accommodate ten (10) guests with only one or two bathrooms. Do not spend your vacation waiting in line to use the bathroom. The B-Hive has three beautiful bathrooms for your use. Two full bathrooms are located on the first floor and one full bathroom is located on the second floor. The first floor south bathroom is a private en-suite bath dedicated to that bedroom. There is also a 50 gallon, high efficiency, quick recovery hot water heater so the last of your group taking a shower does not have to do so with ice cold water. Just a few of the many details we paid attention to when remodeling the B-Hive. No hills! No stairs! No bluffs! : Remember these words when booking your family's summer vacation. How relaxing is the vacation when you have to walk up an endless flight of stairs after a long relaxing day at the beach? We love South Haven! It is a place that is very special to our family. We have welcomed and said good bye to members of our family on the beach. Our children are the fifth generation in our family enjoying the beautiful beaches of South Haven. We are parents of four young children. We wanted a beach house to escape from the hustle and bustle and focus on family. Historic Monroe Park is the neighborhood that is directly adjacent to the North Beach. The key to this location is there are no huge hills nor endless staircases to climb up and down when going to and from the beach. Kind of an important thing to remember with small children and grandparents who want to join you down at the waters edge. toilet, combination tub/shower, Bathroom 1 is located on the first floor of the house. toilet, combination tub/shower, Bathroom 2 is located on the first floor of the house. toilet, shower, Bathroom 3 is located on the second floor of the house. Bathroom 2 is a private bath for bedroom 2 which are located on the first floor just off the Living Room. Cordless phone with answering machine. Central air-conditioning with digital programmable thermost and supplemental second floor window AC unit for those extremely hot days. Ceiling fans and floor fans also provided. All bed linens are provided including extra sets, additional blankets as well as plenty of kitchen and bath towels. Full size, multi-function, front loading stacked washer/dryer (natural gas) located on first floor. Laundry detergent is provided. Full size, multi-function front loading stacked washer/dryer (natural gas) located on first floor. Fabric softener is provided. Side-by-side refrigerator/freezer with in-door ice and water dispenser. Natural gas range with self cleaning oven. Everyday dishes, and utensils are provided. Side-by-side refrigerator with in-door ice/water dispenser. Natural gas stove. Built-in space-maker microwave. Dish washer. Double basin sink w/ pull-out hand-held faucet. Garbage disposal. The dining table has leafs and can comfortably seat ten guests. Comcast digital cable is provided. Over 400 square feet of outdoor patio space with plenty of seating for large families. Also a small semi-private brick patio off of the first floor south bedroom. While the 'B-Hive' is not located directly on the beach, it is within a one minute walk to the beautiful North Beach with no huge hills nor endless staircases to climb up and down when going to and from the beach. Remember this when selecting the home for your family's summer vacation!!! South Haven, Michigan is located in southwest Michigan approximately 120 miles from Chicago, Illinois and 170 miles from Detroit, Michigan. The North Beach in South Haven is the best beach in the Midwest to sunbathe, swim, play volleyball, play Frisbee, build sandcastles, fly a kite, play backgammon, eat a picnic lunch, read a good book, watch magnificent sunsets, take a long walk, spend time with family and friends, take pictures and make memories of a lifetime! Once you agree this is the best location for your family's summer vacation, we ask that you please click on our up to date calendar to see if your desired dates are currently available. Other Activities: Relax and spend quality time with family and friends!! !